Do you want to super-engage your students in robotics and programming? 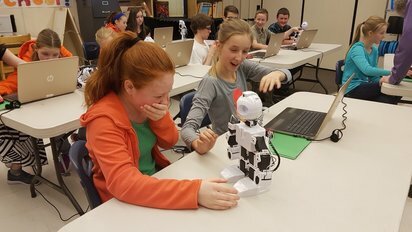 Robots.Education is pleased to offer free interactive robotics presentations for your students! These fun and hands-on robotics sessions will have your students marveling at what THEY can achieve. The free presentations that we offer are approx 1 hour in length, and can be attended by students from any grade. It is appropriate for all ages. 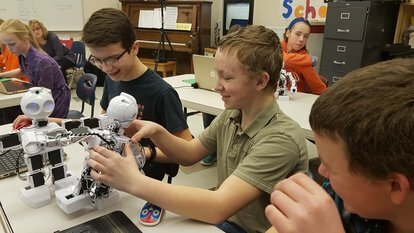 ​In each presentation, we'll talk to students for 10 minutes, about impact that robotics will have on the workforce, and then we'll do a demonstration of what our humanoid robot can do (about 5 minutes). and Finally, they'll program the robot to recognize an object. That object will be one of the students, and the robot will greet the student by name. By the end of the presentation, everyone in the room will be confident that THEY can program a robot (including the teachers), and an average of 90% of students will indicate that they would like to learn robotics (including coding). It's truly remarkable to see and we've had a number of teachers make comments like, "You've changed the culture of our school. The entire school is buzzing about robotics and programming". You won't believe what your children can do! Programs are offered in many cities across North America. Contact us for more information or to book a presentation.